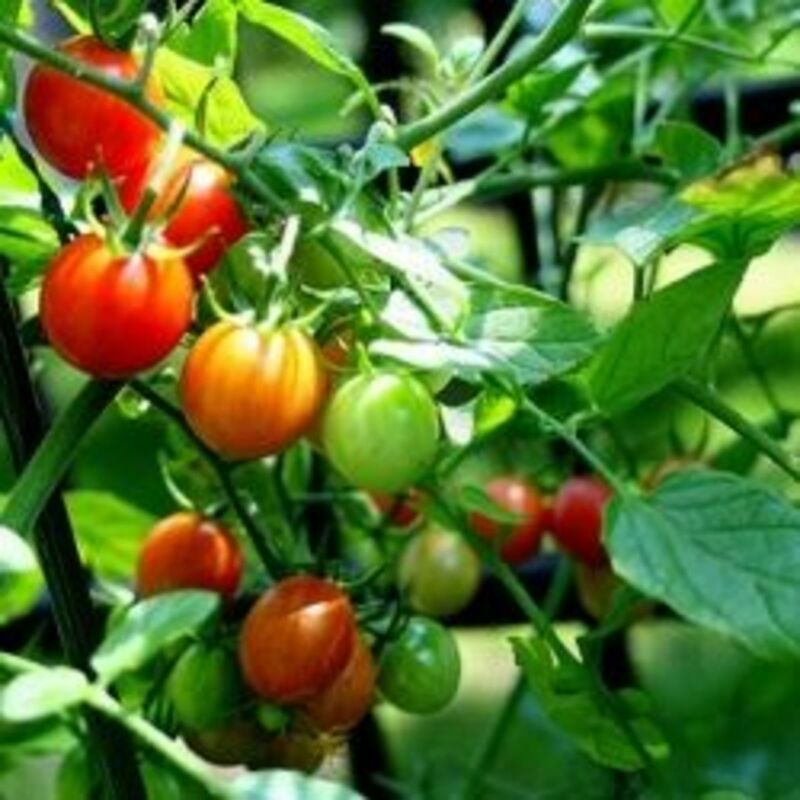 Tomato plants are fairly easy to grow, but here are some tips for producing lot of quality fruit. Tomatoes require at least six-hours of sun a day. They need rich soil full of compost. Black Walnut toxins from trees will kill them, so plant them at least fifty-yards away from the drip line of any Black Walnut tree. Tomatoes can either be grown from seed or small plants. I save seeds from my heirloom tomatoes and start them about six weeks before Memorial Day so they'll be ready when the garden soil is warm and all chance of frost has passed. I also purchase bedding plants from our local nursery to try different varieties and kinds of tomatoes. My favorite Heirlooms are Brandywine that I grow from seeds I've saved. The nursery plants I've had success with are; Early Girl, Roma and Grape Tomatoes. Once in a while I also plant Beefsteak, but Brandywines are better tasting to me. After ALL CHANCE of frost has passed, turn over the soil in your sunny location and dig a hole for your plant. Mix some compost and composted manure in with the soil from the hole. Pinch off all of the leaves except for the top few clusters and place the plant deep, so the only the top leaves remain above the soil. Tomatoes form roots all along their stems and planting them deep gives them a stronger sub-system. Fill in the hole with the soil/compost/manure mix and tamp soil around the plant gently with your foot. Tomatoes need water and a fairly large amount. With water being in expensive and short supply for many folks, I suggest that you set up a couple of rain barrels or five-gallon buckets to collect rain water. Add a few drops of cooking oil to the water to keep mosquitoes from breeding. I use an empty vinegar jug and individually water each plant if we haven't had rain for about a week to ten days. If you water too often the surface roots will over-develop at the expense of the deeper roots and the plant will become weak. Plants sometimes wilt to preserve themselves. They draw the moisture from the leaves to preserve the roots, so a healthy, well-watered plant will be strong and productive. If you look closely, you'll notice little leaf-clusters that grow between the main steam and the larger leaf branches. Pinch these ‘suckers' off as they just drain nutrients from the plant, thus the name. Whenever I think of tying something to a stake I think of St. Joan of Arc. I know people say they have higher yields and less problems when they lash their tomato plants to a post or keep them in a cage - but I just can't do it. If Ma' Nature wanted tomatoes to produce their fuit on a stalk she would have grown them on trees. I grow 'free range' tomotoes. When they start spreading around I gently lift the branches and slide several sheets of newspaper under them (no, mine don't read) but the zinc in the ink deters pests and funugs and gives them a nice clean bed to grow on. Newspapers are printed with soy or non-toxic ink, so just let them decompose into the soil and they will and material to the soile that will hold moisture. It's just my preference, so feel free to toruture (I mean stake) your own tomatoes if you must. One of the most voracious tomato pests known to man are Tomato Hornworms. Some people think they are frightening and run screaming from the garden to make tinfoil hats when they first encounter them. They do look like the came to earth on UFO's (mabye they did?). , I think they're beautiful. You will notice they've arrived because lthe tomato leaves start disappearing and you'll find pea-sized poops on the plants. I think they're amazing creatures and believe it or don't, actually designate one tomato plant just for them. So I put them into witness protection on their own plant rather than kill them. Once they're in place they won't leave the plant. Usually what happens is a bird or garter snake takes them out for me and my karma is clean and their designated tomato plant does just fine. There are also blights and wilts, but it you rotate your crops (I.e.) move your tomato plants to a new location if you have the room.) 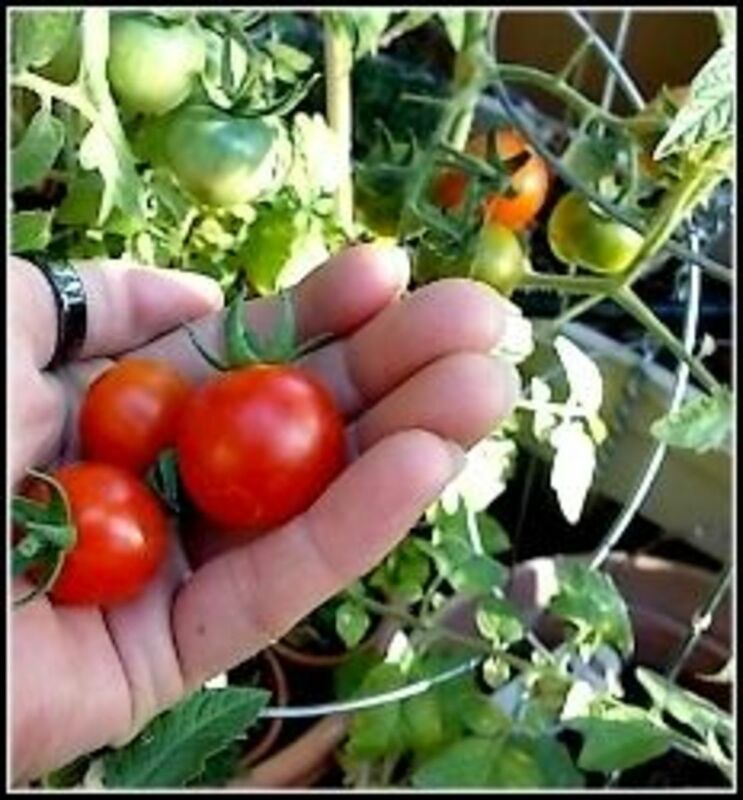 from year to year and keep them well-fed and healthy and you should be ok.
One of the best experiences in the world is standing in your veggie garden while eating a fresh, ripe tomato. However, you'll have many more of them than you can ever graze away. Harvest them when they are uniformly red (or orange or whatever the variety color is supposed to be). Except for Brandywine Heirlooms that rarely get completely red and often have 'green shoulders' - so when they are mostly pink (or lightish red as my grandson says) that's the time to pick them. If you have a lot of unripe tomatoes when the weatherperson announces the first frost is on it's way, don't panic. If it's a very early frost I just put newspaper or plastic sheeting tents over them, as the next few weeks my just be hot and sunner (this happens a lot in Michigan). However, if you know the end is near, go ahead and pick all the unripe or 'green' tomatoes. What I do is fill the sink with water and put just a few drops of houseold bleach in it. This is enough to kill a lot of destructive bacteria but not enought to make them toxic. Drain the sink and rinse them in clear water (cool, not cold or hot). Let them bob around a few minutes to remove any bleach residue. Place them on a clean, dry towel and let them dry. 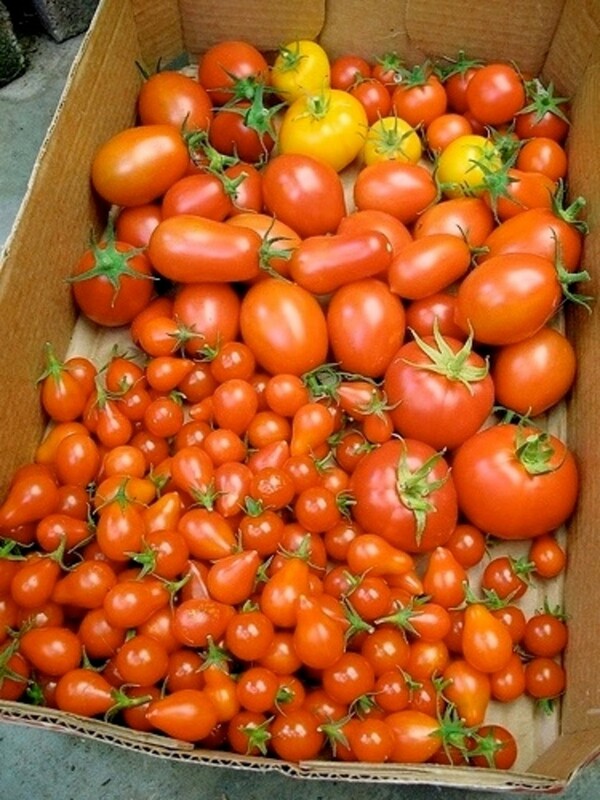 Once they are dry, wrap each tomato in a newspaper and place it in a cardboard box (not plastic, the have to breathe). If you can get the boxes from your produce market that have the little cardboard dividers in them (for grapefruit, orances, etc) even better. Place the tomatoes in the box and store it in a cool dry place. In early winter a garage is ok (keep them off the cement), or later on a basement or enclosed porch. I've served fresh tomatoes up until November using this process. They will ripen in there - but check on them from time to time in case a 'bad' tomato is in there so you can remove it before it corrupts alll the innocents. 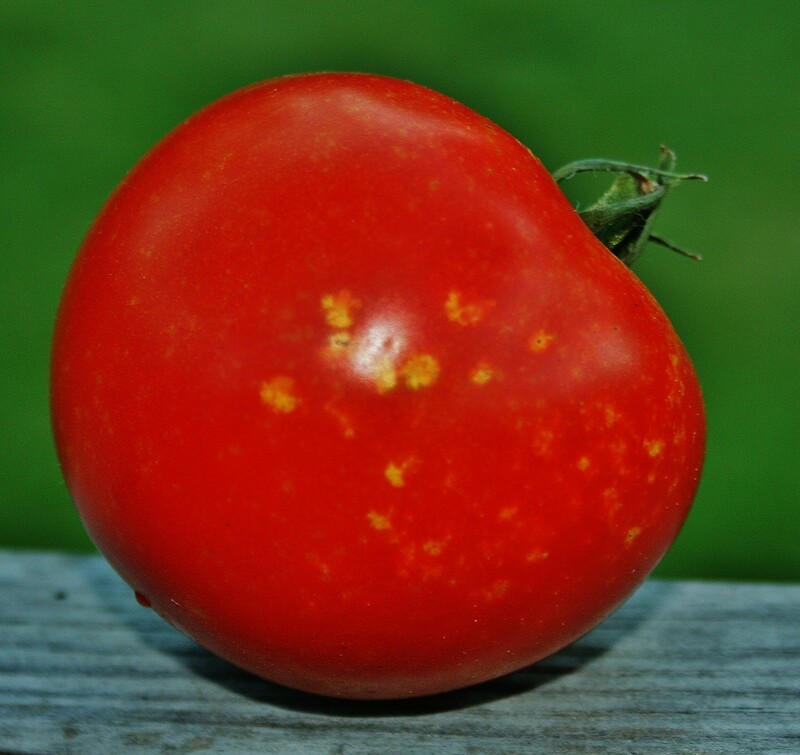 If you haven't grown tomatoes before, try one or two plants of different varieties to start with. This will make them easier to and you may be surprised that you end up with more tomatoes than you know what to do with! Give your tomato plants support and food! Choose Heirloom Seeds so you can save them year after year for planting. Thanks I just planted some tom. for the first time this year upside down, when the leaves turn yellow is that too much water, not enough? How long will my tomato produce? Especially now, considering the recall. My Mom used to try to grow tomatoes. Unfortunately, I think that her hectic work schedule made it impossible for her to give them the care and attention they needed. So, although she got a bit of a harvest, many of her crops died.